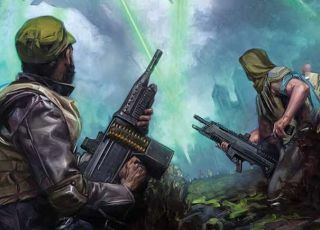 XCOM 2 senior producer Garth DeAngelis explained the apparent disconnect between XCOM: Enemy Unknown, which for most players ended in victory, and XCOM 2, which for all of us will begin in defeat, by suggesting that the sequel takes place in what is basically an alternate timeline. "When we do talk about this timeline, again, it's like Enemy Within never happened," he said at the same. Okay, fine. So what did happen? That's a tale that will be told in XCOM 2: Resurrection, a novel that will lead from the quick trip to Loserville that took place in alt-history Enemy Unknown to the rise of the resistance in XCOM 2. Written by Greg Keyes, a sci-fi/fantasy novelist who has previously written licensed books based on Babylon 5, Star Wars, and The Elder Scrolls, Resurrection will follow the adventures of Amar Tan, a new recruit whose squad stumbles upon an SOS sent by a mysterious man "who claims to know a secret that could change everything." Everything! My guess is that his secret is not quite as everything-changing as he promises, if only because XCOM 2 picks up where the novel ends, and the Earth is still in a big bucket of trouble at that point. I also hope (and assume) that the game will cover the major plot points that led to humanity's downfall; I don't buy into the belief that novels based on game licenses, or any other kind, are inherently bad, but neither do I care for the idea of having to rely on other media to fully understand what's happening in my video games. XCOM 2: Resurrection is available for preorder at Insight Editions, and will go on sale on November 10. That's probably about when XCOM 2 itself was expected to launch, before it was delayed into next year.